Missing teeth? You don’t have to feel embarrased or uncomfortable anymore. Our dental implants will put the sparkle back in your life! They look and feel like your natural teeth. Ask Complete Dentistry of Orland Park, Illinois if implants are right for you. Dr. Curt Ringhofer has extensive training and experience in implant dentistry and will ensure maximum comfort with a natural look and feel. He holds the distinction of being a Fellow in the “International Congress of Oral Implantologists”. The skilled family and cosmetic dentist is well-known for top quality dental care that’s personalized to meet the needs of his patients. People come to him for their oral care needs from all parts of Orland Park, Tinley Park, Orland Hills, Palos Park and Homer Glen in Illinois. Missing teeth affect your appearance and facial structure. The gaps can weaken the support to other teeth and may even result in bone shrinkage or loss. We can help you restore good oral health. Call (877) 478-1353 or set up your implant appointment online. Our trusted dentist has successfully performed numerous implant procedures. He employs the latest dental equipment to select a suitable size, shape and color to blend with your natural teeth. You’ll rest easy knowing that your comfort and well-being are always his top priority. If the fear of pain or discomfort has prevented you from getting dental implants in the past, we have good news for you. Dr. Ringhofer provides sedation dentistry and is also trained in the use of nitrous oxide analgesia for relaxed pain-free dental procedures. Whether it’s for implants, TMJ/TMD or veneers and teeth whitening, rest assured you will be well taken care of with quality dental care. Complete Dentistry of Orland Park offers top quality dental treatment and excellent patient aftercare. You’ll also find our flexible payment schedules, evening appointments and 24-hour emergency service very convenient. 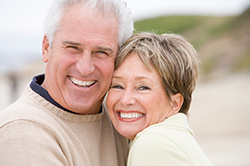 Contact us at (877) 478-1353 or online for complete dental care and dental implants Orland Park. Understanding our patients’ needs is always our first priority!